A massive congratulations to Tommy Makinson, Luke Thompson, Jonny Lomax, Mark Percival and James Roby on well deserved call ups to the England squad to face New Zealand in Colorado. Makinson has been in fine form in the red vee this season – his ability to bring the ball away from his own line like a second row forward, his aptitude dealing with opposition kicks whether spiralling bombs or difficult to field grubbers, his never say die attitude, allied to his wonderful finishing make him one of the stand out wingers in this year’s competition. He has seemingly grown more in confidence this season, allowing him to become one of the sides leaders. If selected, England will get nothing less than 100% commitment from the winger, as well as the versatility Makinson offers across the back line. So here’s to you Tommy Makinson, England fans will love you more than you will know. Luke Thompson has started the season with a bang. The young prop forward takes no backward steps and is playing like a seasoned professional. After Alex Walmsley’s injury, Saints fans could be forgiven for thinking we would lack some grunt up front. However, the whole pack has stepped up and, led by Thompson, has shown aggression and power. Hopefully Luke gets the chance to show his worth in an England shirt. Open letter to Sky anyone? If you managed to find the Catalans v Widnes game, hidden away behind Gaelic Football on the red button, then you were in for a real treat. It wasn’t that the Dragons and the Vikins served up a real feast of Rugby League, it wasn’t that the game was in the balance until the very last minute, it was that Sky had 2 people behind the mic – and one of those was the wonderful Tony Rea. Rea spoke eloquently on the game, describing the action in such a way that new Rugby League viewers would understand without patronising those who have watched the game for decades. He didn’t look for controversy. He didn’t try to find fault with the officials. He didn’t try to be funny. He was naturally endearing. He was knowledgeable. He made the broadcast eminently watchable. It was the finest broadcast for many a year. Even if Bill Arthur was bumbling through the main commentary, Rea kept on track giving reasoned opinion, spotting things in real time and telling the audience about how he’d seen the action. There was no claiming that Stefan Ratchford and Sam Tomkins were battling Ben Barba in a 3 horse race for best Super League full back (Phil Clarke apparently – newsflash Phil…Ben Barba is the best full back in the league, he’s also second and third best. And probably fourth too.) He wasn’t trying to be the comedy act. He wasn’t trying to be outlandish. He wasn’t trying to call the game and also shoehorn opinion when it wasn’t needed. And he certainly wasn’t trying to second guess the referee’s decisions. What I’m trying to say is less is more for Sky. Football’s coverage on Sky improved immensely when Richard Keys and Andy Gray parted ways with the broadcaster. And after so long, it’s time for a freshen up in the Sky Rugby League studios. There’s only the need for a commentator and one summariser – the Catalan-Widnes game proved that beyond doubt. I don’t mind a touchline reporter letting us know what’s been said at half time or about any injuries. Do we need as many summarisers at the game – especially when some try to justify their wages by talking absolute tosh. Would football put up with that many opinions during the action? No, so why should we. I’d definitely say goodbye to Phil Clarke and Stuart Cummings. The former referee merely confuses matters when trying to talk us through a referee’s thoughts on a decision. Turn the refs on field mic up so we can hear exactly what he’s saying and mic up the video ref again. No need for a camera, just him talking us through the process. I’d keep Barrie and Terry, they’re both are good broadcasters, but they’re not Morecambe and Wise. They’re not even Ant and Dec. They should be part of a pool of summarisers, not always on together, which includes players from every position – let’s have the point of view from a back, not just 2 forwards. One summariser in with the commentator, one in the studio with Brian (who’d be the anchor for the show). Sky could cut to the extra summariser during the game, and they could make their way to the studio for half time/full time analysis. I’d already be in the hunt for a top commentator to take over from Eddie. Not necessarily the next cab off the rank but the best person for the job. If Andrew Voss wanted the job he should be top of the list. And finally, I’d throw all the money he wants at Tony Rea. He’d be on the Friday night game every week. Can I copy and paste the Catalans game review I wrote into here? That’ll do won’t it? Covers pretty much everything. While the game didn’t hit the heights many of us crave, it was a functional performance with could have been stepped up at any moment. We coasted through in first gear and if we’d have taken a few more of the opportunities that presented themselves to us we could have easily doubled our winning margin. The flow of the game wasn’t helped as Hull KR seemingly knocked on more than an Avon lady. The match wasn’t short of wow moments though. Zeb Taia’s offload to set up Ben Barba was a blink and you’ve missed it moment. 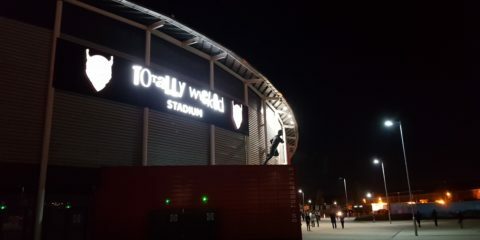 From 100+ metres away in the West Stand it looked great, on the highlights feel it looks even better. At the end of the first half, Barba broke and instinctively kicked through to the ever willing Tommy Makinson who does through and was only a couple of feet away from scoring a wonderfully improvised try. 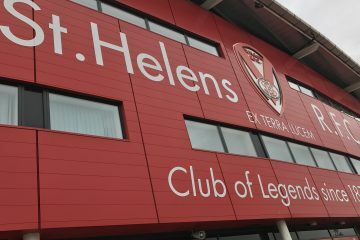 If you’ve not seen the excellent pictures from Bernard Platt head over to the St. Helens Star website and take a look – once you’ve finished reading this, of course! In the second half, Dom Peyroux put in his dancing shoes and sent Danny Richardson away towards the line. Before he could be tackled, the young scrum half kicked off his ‘weaker’ foot and the ball sat up wonderfully for Percival to score. Finally, Ben Barba put the icing on the cake, finishing another length of the field effort which was started by Mark Percival. It’s a shame that some fans missed it live, as every moment that Barba is on the field is another moment that could include a flash of brilliance. 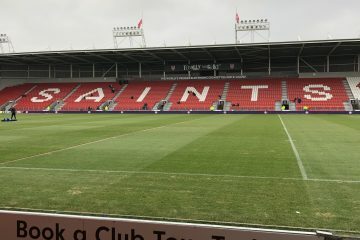 It was evident that Saints missed Jonny Lomax in the halves, his influence over the past few weeks has been growing with every game. That’s not to say Theo Fages didn’t have a decent game, he was still his busy self, but Lomax has cemented himself into the stand off role. I was pleased to see Danny Richardson taking on the line as usual, jinking and stepping to try to find a gap. Keeping the opposition thinking is a big asset for a half back, and while Richardson isn’t the finished article yet, it’s great to see his confidence growing each game. I’d also argue that Saints missed Jon Wilkin too. Wilkin isn’t everyone’s cup of coffee but he is a leader, and the more leaders we have on the pitch the better. His absence did allow Matty Lees (with his shiny soled boots) some game time, and he certainly doesn’t look out of place in Super League. Louie McCarthy-Scarsbrook brought energy to the pack, especially in the second half, generally ensuring that Saints continued to move forward. As we said on Redvee TV, it’s ok to have games like Friday nights. Not all matches will be high intensity, edge of the seat, attacking and defending for your lives rugby – especially 5 days after a Cup game which was exactly that. You’ll get the odd game which is a little flat, even in 2006 we had games like that. It is the type of game that a few years ago would have finished 26-22 and fans would’ve moaned about why it was so close. Instead we got the 2 points, it was comfortable and we move on to Leeds away.